Chicago, IL - Fr. 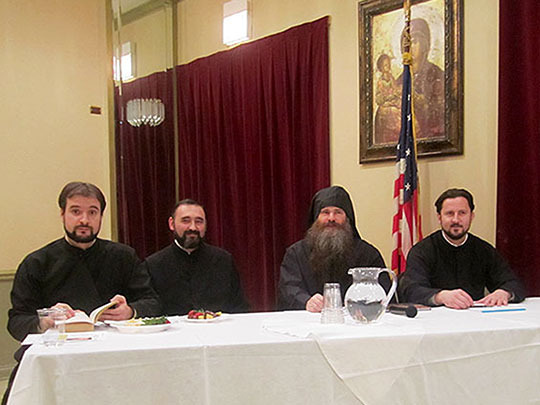 Gerasim drew on his 30-years of monastic experience to speak about watchfulness of the heart, the heart being the "battleground" of the spiritual struggles Orthodox Christians wage during the Lenten journey. Fr. Gerasim's presentation, supported by references to the Holy Scriptures and Church Fathers, provided a valuable insight into the fruits of watchfulness of the heart: repentance, forgiveness, un-selfishness, a more vigilant prayer life, and a fuller experience of the Grace-filled Mysteries of the Orthodox Church. Following his talk, Fr. Gerasim answered questions about prayer and fasting, guarding against judgment in personal relationships, seeking forgiveness, and the monastic lifestyle. The Lenten Seminar was preceded by a Great Vespers service and a dinner prepared by the Cathedral community. This event was jointly sponsored by the Cathedral's Executive Board and Education Board.